When you deposit money in a bank or credit union, you need to fill out a deposit slip to direct the funds to the right place. Deposit slips tell the teller who you are and what you want to do, and they also create a paper trail for every transaction. The process of filling out deposit slips varies depending on what you’re doing. For example, cash and checks go in different sections, and getting cash back from your deposit requires an additional step. Fortunately, the process is easy, and the basic steps are listed below. Provide personal information, including your name and your account number. If you have pre-printed deposit slips from the back of your checkbook, this is already done for you. Fill in additional details such as today’s date and any branch information required. If you’re a credit union member using a different credit union’s branch, you’ll need to write in the name of your credit union. List the cash amount of your deposit, if any. This is the total amount of currency (bills and coins) that you’ve brought for deposit. If you do not have any cash to deposit, leave this line blank. List checks individually, including the check number and amount of each check. See below for more details on entering checks. If you don’t have any checks to deposit, move on to the subtotal. Add up deposits for a subtotal. This is the total amount of cash and checks that you have to deposit. Enter the amount of cash you’d like to take, if any. When your entire deposit consists of checks, you might want cash now so that you don’t have to make a withdrawal later. Calculate the total deposit, which is the sum of your deposits minus any cash you take now. Sign the deposit slip if you are getting cash from your deposit. Depositing checks can be tricky at first. The key is to list each check individually, so each check gets its own line. There’s space for you to enter the check number next to the dollar amount of each check, which helps you and your bank keep track of each item. Dollars and cents: If you want to score bonus points with the teller, enter your deposit amounts in dollars and cents. You’ll notice separate boxes for each entry (on most deposit slips). The box on the far right is for the decimal (or “cents”) portion, and the next box to the left is for the full dollar amount. It’s not a big deal if you don’t get this perfect, but with some deposits— especially large ones—tellers might require that you get all of the commas and decimals in the right place. More room: If you’re depositing numerous items, use the back of your deposit slip (or ask a bank employee for guidance). 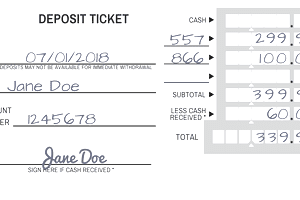 Most deposit slips have an extra set of boxes printed on the back so that you don’t have to enter your personal information again and deal with multiple subtotals. Some automated teller machines (ATMs) allow you to make deposits. Depending on your bank, you may or may not have to fill out a deposit slip. Some ATMs deposit to your account based on the debit/ATM card you use, and they can even scan cash and checks in real time. This allows the bank to add funds to your account immediately, although the money might not be available for immediate withdrawal. Other banks require that you put everything in an envelope and fill out a deposit slip, which an employee will use to manually record your deposit. If you're making a remote deposit with your mobile device, you typically don't need to use a deposit slip. At most banks, you're already logged into your account when you snap a photo of the check, so you don't need to provide those details. Typically you'll just confirm the dollar amount and review the account and routing information from the check. When can you spend the money you deposit? Your bank sets rules, called a funds availability policy, which explains how long you need to wait to spend the money. In many cases, you can take up to $200 in cash from a personal check within one business day. You may be able to get more when you deposit a cashier’s check or USPS money order. The best way to know how much you can spend is to check your available balance or ask bank staff when the funds will become available. Most importantly, don’t assume that you can spend all of the money from large check deposits immediately.